Does it matter whether Turkey admits it was genocide? Yesterday, I attended a talk by a well-known reporter who has covered the Armenian community and the United Nations throughout her career. At the end of the talk, the question of whether it matters if Turkey admits to the Armenian Genocide came up. I chose to listen to the opinions shared, not offering mine despite being among Armenians in the familiar surroundings of the Eastern Dioceses of the Armenian Church complex. It is interesting to note that Armenians do not share one mind when it comes to the topic of the Armenian Genocide. While there is no doubt in any Armenian’s mind about the veracity of the facts concerning the Armenian Genocide, we do not all agree on what to do with this knowledge. 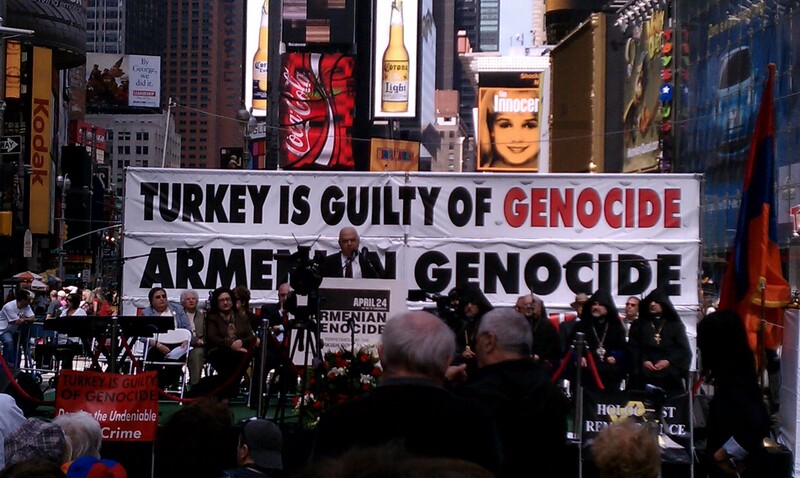 Many Armenians (like a significant percentage of those attending the commemoration of the 96th Anniversary of the Armenian Genocide in Times Square) want reparations and land. Many only want an official acknowledgment and apology from the government of Turkey. Opinions also tend to be colored by whether or not an Armenian individual’s family was a victim of the Genocide or not. Present-day Armenians living in Turkey frequently disparage Armenians in the diaspora for our politics, which is something not altogether surprising, because the Turkish government considers the vocal diaspora (especially in the United States) to be a thorn in its side. As I’ve come to learn, Armenians from the former Soviet Republic of Armenia and the Middle East have varying degrees of knowledge about the Armenian Genocide. Generally speaking, Armenians living in Europe and the United States have historically had far greater access to the wealth of knowledge about the history of the Armenian Genocide. This, too, informs the opinions Armenians have about the Turkish question. Today is Memorial Day in the United States. It is a national holiday and time to honor the war veterans who served to protect and defend the United States in wars. Yesterday, in France, a Khachkar commemorating the victims of the Armenian Genocide was inaugurated in Versailles, France. Armenian-French singer, Charles Aznavour unveiled the Khachkar at the ceremony. In France, on April 24th French-Armenians remember not only all those who lost their lives during the Armenian Genocide, but also all the Armenians who gave their lives for France in war. The US and France have the largest Armenian populations in the Armenian diaspora. In Argentina, home of the third largest population of Armenians (descendants of Armenian Genocide survivors), protests to prevent a bust of Kemal Ataturk from being erected in Buenos Aires, Argentina’s capital city, were successful leading to Turkey’s Prime Minister Erdogan canceling his visit to Argentina. Many Armenians from Marash live in Argentina. My grandfather was from Marash (he eventually settled in New York). He survived the massacre carried out by Kemal Ataturk in 1920. Not only does Turkey deny the Genocide, the Turkish Government also asserts that Ataturk was not responsible for any of the massacres. However, that is not true. If you have the stomach to handle it, google ‘Armenian Genocide Pictures’ and see the results for yourself. You will see thousands of images that will be seared into your consciousness from archives, private collections, books, libraries and museums around the world. The newspaper accounts within Turkey and here in the US provide some of the most damning evidence of the atrocities committed upon the Armenians by the Turkish leadership during the years before and after 1915. …there’s no question what recent Jewish theory teaches out about the Armenian genocide: That it was, indeed, a genocide. In 1986, I took Yad Vashem’s 3-week intensive study course on the Shoah, and I’ll never forget what Yehuda Bauer — the preeminent Shoah scholar — taught us: The Armenian genocide was the Holocaust’s “cousin if not its brother.” What persuaded him, he said, was evidence that the Ottomans looked to physicians to facilitate the massacres — a precursor of the science the Germans used to speed up their genocide just decades later. For Turkey to blame the Armenian Diaspora for causing the House Foreign Affairs Committee to pass HR 252—consequently insulting Turkey—is perverse (akin to the domestic batterer accusing the victim of slandering him for speaking out). I wish I could speak to the family of the righteous Turk who saved my grandfather and great-grandfather, but, sadly that act was not considered heroic in Turkey; it was punishable by death. And, it is still a crime to ‘insult Turkishness’. Perhaps it is the current Turkish Government and its policies that is insulting Turkishness. I was curious when I saw an article posted online by the Associated Press today. It mentions the existence of the “Hall of Armenian Issue with Documents,” which is located in Istanbul. When I read a description of what it contains, my heart cried. How can Armenia and Turkey achieve a real and lasting peace when generations of Turks have been indoctrinated to believe that Armenians were the aggressors during the atrocities committed in 1915? What will be the fate of the Armenians in the world’s collective memory if the Protocol is signed between Armenia and Turkey, before Turkey acknowledges the truth–that genocide was committed by the Ottoman Turks? I started this blog because I sincerely want the world to know what happened to my grandfather Karnig, his sisters and his mother, during the Armenian Genocide. My intent for this blog: https://armeniangenocideblog.wordpress.com is for it to serve as a forum for Armenians to honor the memories of their family members. While I did not want this blog to depart from that vision, this moment in world politics interrupted my project plan. At first glance I was relieved to hear the news that Armenia and Turkey were seeking peace through a Protocol. But, as I read more about the dynamics of the process and the details of the Protocol, I recognized this diplomatic initiative will not serve Armenia, and it will exacerbate the open wound which remains in the collective heart of the Armenian diaspora. What good is peace when only one side stands to gain? How can such a peace last? Once the Protocol is signed, how will Armenians the world over succeed in compelling Turkey to do what is morally right–to stop actively bearing false witness (paying lobbyists to convince our lawmakers to vote against resolutions acknowledging the Armenian Genocide, pressuring school districts and universities to remove mentions of the Armenian Genocide from their curriculum and textbooks, referring to the “so-called” “Armenian Issue”…maintaining the “Hall of Armenian Issue with Documents”…)?